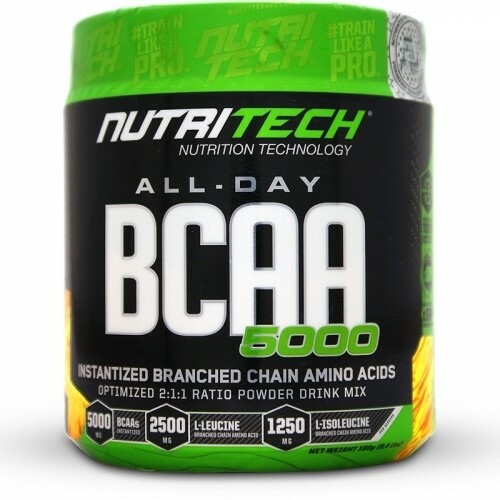 Nutritech All Day BCAA 5000 is a stimulant-free intra-workout and functional amino hydration drink. Branched Chain Amino Acids (BCAAs) have been shown to prevent muscle wastage during training when taken before the workout. This is especially important when training first thing in the morning without having eaten anything. The goal is body recomposition; decrease body fat and increase lean muscle. Not just drop weight on the scale. This formula is engineered with 2500mg Leucine, 1250mg Isoleucine and 1250mg Valine to deliver BCAA hydration to the muscles and prevent muscle breakdown. Protein synthesis is how efficiently the body utilizes the protein it receives from food sources or protein shakes. This biological process is what separates an easy-gainer and a hard-gainer. The L-Leucine in BCAAs has been shown to stimulate protein synthesis by means of the mTOR pathway. Designed to speed up post-workout recovery when taken as directed. 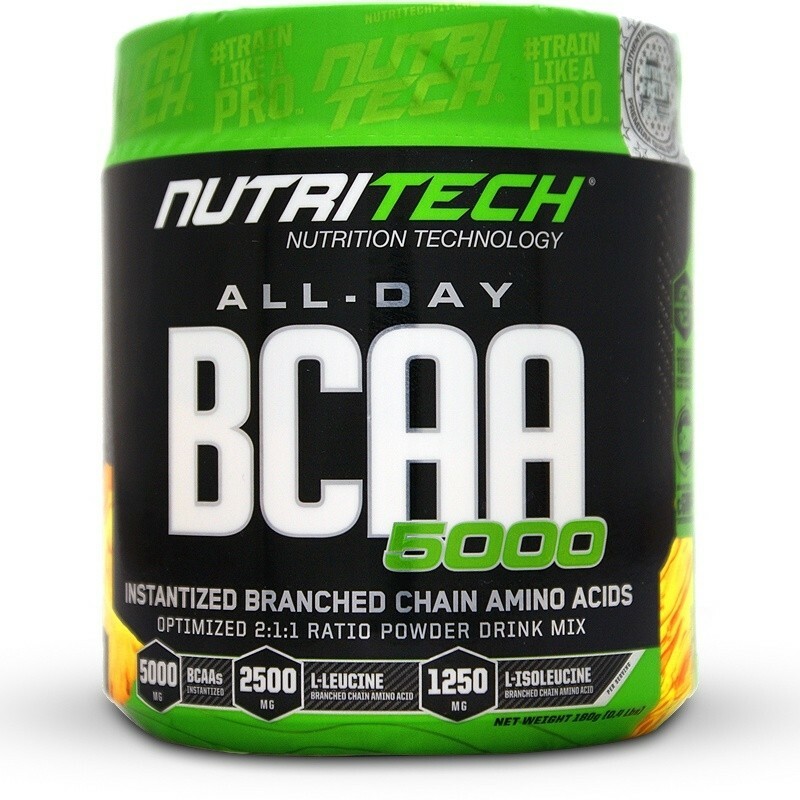 Nutritech All Day BCAA 5000 delivers 5000mg of Instantized Branched Chain Amino Acids on the research validated 2:1:1 ratio. Citric Acid, Malic Acid, Flavour, Silicon Dioxide, Calcium Phosphate, Sucralose, Acesulfame Potassium, Colourant (E110 Polar Pine, E122 E133 Glacier Grape). Mix 1 scoop (approx. 6g) with 250ml of water in a NUTRITECH® shaker. Shake thoroughly and drink during your workout. On training and non-training days, take one serving throughout the day. *Can be taken pre, intra or post-workout. Regular training and proper nutrition are essential for achieving your goals. The ingredients used to formulate this product are not banned for professional sport. This product is safe for use by professional athletes. Best BCAA I have ever used. Tastes amazing! I like this, works good! Not as much DOMS as without this product. Both flavours taste good, but the Apple is my favourite - I mix it with 600ml of water, this way I have enough to drink while exercising and it still tastes sweet enough. Taste great and works well!